The U.S. Patent and Trademark Office (USPTO) is weeks away from approving a controversial British patent that could force American consumers to pay more for GPS navigation devices and even affect the operations of the American military. The patent is one of dozens filed around the world by the British defense establishment asserting ownership of technology developed jointly by the United States and the European Union (EU). The patents lay claim to a signal structure crafted by American and European experts to make Europe’s still-emerging Galileo satellite navigation system interoperable with GPS and improve service for users of both systems. Over the last year Ploughshare Innovations, a wholly owned subsidiary of the research and development division of the British Ministry of Defense has been contacting receiver manufacturers in North America and Europe asserting intellectual property rights to the signal structure and, in some instances, requesting royalties. In one case, said a source who asked not to be named, Ploughshare was seeking a percentage of receiver revenues. Should the U.K. be able to enforce the patents, buyers of receivers that use the signal will likely pay more. That includes U.S. agencies such as the Department of Interior and the Federal Aviation Administration, which use GPS for mapping and air traffic control. Though the U.S. government has apparently not been asked to pay royalties at this point, Ploughshare has contacted the maker of the new GPS III satellite, according to the official. The GPS III satellites will be the first U.S. spacecraft to transmit the civil signal, L1C, based on the common signal design. Lockheed Martin, the prime contractor for the GPS III satellite, declined to comment on the issue. Receiver manufacturers, however, have been vocal about the patent claims. Companies on both sides of the Atlantic have complained to their governments and prodded their professional associations to speak up, sources have told Inside GNSS. Exactly what that solution may be remains to be seen. U.S. officials have been studying the issue and will meet in June to decide on a course of action. “We’ve collected the information, but we haven’t got an approved position yet,” said Russo. According to sources familiar with the controversy the first step appears to be an agency-to-agency conversation between U.S. and British defense officials. The U.S. State Department is also involved, and discussions have taken place between diplomatic representatives of the two nations. The British delegation in Washington did not response to calls about the issue. The U.K.’s Defence Science and Technology Laboratory (DSTL) — the owner of Ploughshare Innovations — declined to comment for this article. Should efforts to negotiate a solution fail, U.S. officials can challenge the patents in court. In the process, sources tell Inside GNSS, they may assert that Americans actually invented the technology. The signal structure emerged from the work of the Galileo Signal Task Force of the European Commission. The group was created as part of the Agreement on the promotion, provision and use of Galileo and GPS satellite-based navigation systems and related applications — a landmark 2004 accord formalizing cooperation on satellite navigation between the United States and more than two dozen European countries, including the U.K. 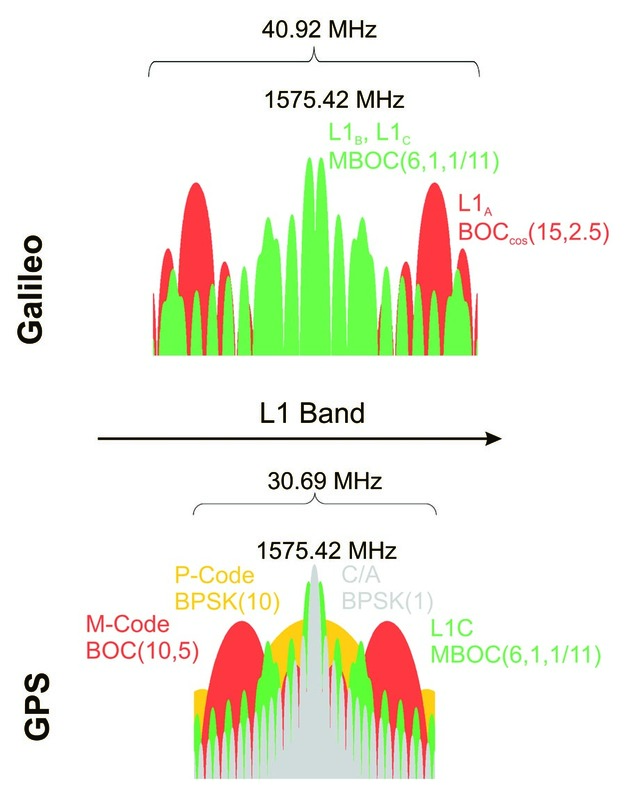 The frequency structure developed by the task force will be used by GPS’s new L1C civil signal and Galileo’s E1 signal for its Open Service. Called MBOC — short for multiplex binary offset carrier — the signal structure laces a BOC(1,1) signal with an occasional BOC (6,1) signal to work around the limitations created by spectrum crowding and reduce the multipath errors created when signals bounce off reflective surfaces. Experts from both the United States and the European Union participated, and the cooperative nature of the Task Force seemed, at the time, to mark a turning point in a sometimes sharp-elbowed U.S.–EU relationship on GNSS issues. The revelation of the patents over the last eight months has turned the clock back and is likely, said sources familiar with the issue, to cool future collaboration. In fact, U.S. officials are so angry about the patents that dropping the MBOC signal structure has emerged as an option. That would probably require Lockheed Martin to modify the signal generators that have been designed for GPS III satellites. The patents at issue fall into two groups — actually two families of patents, each springing from one of two filings with different priority dates: in the case of the two U.K. patents, one is September 1, 2003, which is before the task force was formed, and the other is June 20, 2006 — well after the group began meeting. The priority date is very important in patent disputes because they are generally what patent examiners use to help determine when something was invented and, most importantly, who invented it first. All subsequent patents in the same family, including those filed in other countries, rely on the priority date of the initial patent to establish their legal place in the patent-rights pecking order. In many other ways the two families are similar. Ownership of both patent families has been assigned to the British Minister of Defence and both list as inventors Tony (A. R.) Pratt and John I. R. Owen. Pratt is a consultant to the British government in the development of the Galileo satellite system as well as a member of the Inside GNSS Editorial Advisory Council. Owen is leader of navigation systems, Air Systems Department, and a senior fellow at DSTL. Both men were members of the signal task force, a fact that has raised questions about the actual source of the invention, the patenting of MBOC and, by extension, the validity of the 2006 patent. Neither Pratt nor Owen responded to a request for comment for this article. The 2003 patent is for “Modulation of signals for a Satellite Navigation System” There are five U.S patent applications in this family, said Pollmeier. Two are ready for examination and one has been given a non-final rejection. As of March of this year, two continuation applications have also been filed though they have yet to be published. These, as the name implies are filed to keep alive the conversation with the patent office as discussions continue or changes are made. The attention of U.S. officials appears to have been largely focused on the earlier family and an opportunity to challenge the patent in Europe Union and, by extension, in the U.K. The United States has until November 2 to challenge the 2003 patent before the European Patent Office (EPO), said lawyers Ingo Baumann of the space industry law firm BHO Legal and Ingolf Bode of the patent law firm Bode Meitinger, both in Germany. “The decision of the EPO on the opposition procedure has effect for all 28 contracting states, including UK, and would be the easiest way to challenge the European Patent,” they said. See the sidebar, “A European Perspective on Patent Dispute over GPS-Galileo Civil Signal,” for additional comments from Baumann and Bode. The 2006 patent is for “Signals, system, method and apparatus.” A single U.S. patent has been filed in this family — and it is on the verge of being granted. Federal officials are aware of the patent’s imminent issuance and have talked to the USPTO and the Departments of Justice and State, said Russo. As of press time, however, no action has been taken. Should willful infringement be shown – that is should someone knowingly infringe – then those damages could triple. Sometimes parties will give notice regarding their patent right before it issues or right after it issues as a way to establish this, Medlock said. Still unclear, however, is whether the contact with Lockheed Martin or the letters sent to European manufacturers — which, a source said, asserted Ploughshares patents but did not immediately ask for royalties— are part of an effort to establish willful infringement or push for an injunction. There is a legal standard of notice for infringement that the letters would have to meet, noted Pollmeier. “It is not an easy (case) to bring, an easy standard, to meet,” said Medlock. The game is definitively afoot, however, and the United States is preparing to respond. There are several grounds on which the U.S. might try to challenge the patents, suggested Pollmeier, who like Medlock, Baumann and Bode is not involved in the case. For example, in the case of the 2006-family patent application the USPTO examiner ignored a letter submitted February 7 regarding two MITRE Corporation patents on “Time-Multiplexed Binary Offset Carrier Signaling and Processing” that were “expressly abandoned . . . to allow universal free access to the invention.” These patents could have been considered evidence of an earlier invention – something that the examiner could point to as a reason to deny the applications. The letter was not considered, however, because it was not correctly filed, according to Pollmeier. The very existence of the 2006 family of patents also creates a question about the applicability of the 2003 patent family to MBOC, Pollmeier suggested. Pollmeier, who was involved in the testing and early utilization of the prototype GPS satellites and became particularly familiar with signal structures during 12 years as principal system engineer at NASA’s Jet Propulsion Lab, said that the 2006 patent appears more applicable to the MBOC signal than the 2003 patent — an opinion broadly expressed by several expert sources who spoke to Inside GNSS. But by granting the 2006-family application in the United States the U.S. patent examiner has effectively determined that the 2003-family patent does not cover the same invention as the 2006-family patent. If it did it would be prior art and the 2006-family patent would not have been granted. If the 2006 patent is more applicable to MBOC — and the 2003 and 2006 patents are not about the same technology, “that would suggest that, if the 2006 family of patents is specifically directed at the MBOC signal, then the 2003 family of patents are not as clearly applicable to the present MBOC signal,” Pollmeier said. “Someone has decided that those 2003 patents actually don’t claim the same invention [as the 2006} and don’t disclose enough to invalidate the subsequent patents,” he explained. That must have been the view of the British Ministry of Defence as well, he added, or they would not have filed the second patent application. 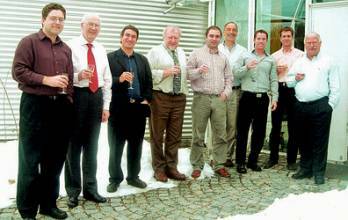 Bode pointed out that, though the initial patent was filed in 2003 in the U.K. the members of the task force could not have known about it because it was not published until 2005 and therefore unavailable to people outside of the inventors’ circle. “There are certainly those who would call this an ambush patent,” he said.